The first church on this site was built by the Saxons 1300 years ago in the 7th Century AD, on land given by Caedulla, King of Wessex to St Wilfrid, in gratitude for having saved the people of the area from starvation. Later, when St Wilfrid returned north, he gave Pagham to the Archbishops of Canterbury, who remain Patrons of the Parish to this day. The foundations of this early church were rediscovered when the church floor was re-laid in 1976. Some stones from these foundations were built into an oak-topped table which can be seen in the south transept. A piece of Saxon cross was found at the same time. In the 1950s fragments of a Saxon burial urn were found in the churchyard. This was restored by the British Museum and and is displayed in a case in the south aisle. After 1066, many of the new lords of the manor built churches in the Norman style. Pagham was no different and a new larger Norman church was built on the site of the old Saxon one. The font bowl dates from this time. It is carved with Norman arches and has a leaf pattern. 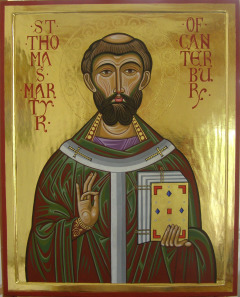 Archbishop Thomas à Becket was murdered in Canterbury Cathedral on 29th December 1170. The church was again rebuilt within 40 years of this date and there is no doubt that the church is one of the earliest to be dedicated to St Thomas à Becket. Although there are no elaborate tombs in the church, on the wall of the south transept there is a stone to the memory of Edward Darrell, ‘Caterie’ to the household of Queen Elizabeth I. Today, the structure of the church is much as it was eight centuries ago, with the Early English style of architecture being reflected in the nave and chancel. Bell ringing is very much a part of our church life and the oldest of the six bells in the tower dates from 1666. The Victorians built a choir vestry, with a gallery over, near the west door. In 1836 the west front had to be completely renewed and a rose window was installed. The glass in the window today was given in 1936 by Sir Arthur du Cros in memory of the convalescence of King George V at Craigweil House in 1929. Queen Mary worshipped at our church during that time. In 1996 St Andrew’s Chapel was built to provide modern facilities for the Sunday School and other gatherings. Artefacts found when the foundations were being dug show that the site of the church was being used for religious purposes as far back as 1500 BC – that is before the time of Moses! The church today, far from being a museum, is a thriving spiritual centre. We hope you will visit us sometime to see our lovely church and its grounds, and perhaps join us at one of our services. You would be most welcome.